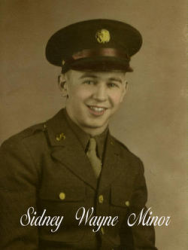 Sidney Wayne Minor was born on 4 February 1918, in Georgia, to George Sidney and Annie Cordelia Minor. On 30 December 1944, Technical Sergeant Minor was serving with the 861st Bomber Squadron, 493rd Bomber Group (Heavy), in England. That day, he was serving as a crew member on a B-17 Flying Fortress bomber, which departed from Felixstowe, England, on a combat mission to Kassel, Germany. While climbing through an overcast at the start of the mission, the number one engine started smoking and then blew up in a burst of flame. Considerable altitude was lost before the plane was under control again and when an interphone check was made it was discovered that Technical Sergeant Minor and four other crew members had bailed out over the North Sea, approximately twenty-five miles off the coast of Felixstowe, England. The plane retraced its original route but the men were not sighted. Searches were instigated but no trace of the men could be found. 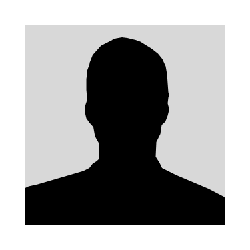 The five men were originally listed as Missing in Action and a presumptive date of death for the termination of pay and allowances, settlement of accounts and payment of death gratuities, was issued. By law, that date was to be the day following the expiration of 12-months absence, which for these five men was 31 December 1945. However, in a letter from the War Department dated 5 February 1948, Minor's mother was notified that, because Technical Sergeant Minor bailed out over the North Sea about 25-miles from the English coast and over 50-miles from enemy territory, the Army's records were being amended to show that he was Killed in Action on 30 December 1944 in the North Sea. In a letter to Minor's mother from the Secretary of the Army, Kenneth C. Royall, dated 11 March 1948, she was notified that: "You will shortly receive the Purple Heart medal, which has been posthumously awarded by direction of the President to your son, Technical Sergeant Sidney W. Minor, Air Forces. It is sent as a tangible expression of the country's gratitude for his gallantry and devotion." 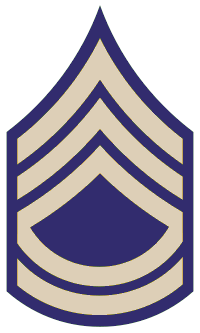 Technical Sergeant Sidney Wayne Minor was killed in action on 30 December 1944. He was lost at sea and his body was never recovered. His name is listed on the Tablets of the Missing at the Cambridge American Cemetery and Memorial in Coton, Cambridgeshire, England.